Despite being a beefier version of the Zenfone Max M2 in terms of overall pros and cons, our review of the 2018 Asus Zenfone Max Pro M2's specs revealed a couple of weak points for this high-endurance mid-ender. 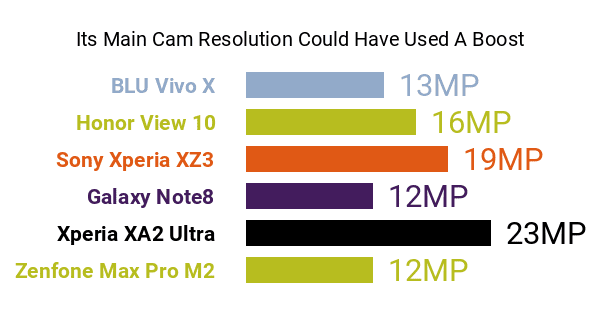 For one, it won't be joining Phonerated's list of the best camera phones, seeing that its 12- plus 5-megapixel dual rear camera is no huge improvement over the plain Max M2's 13- plus 2-megapixel setup -- some rivals reach 16-megapixel main cam resolutions. That being said, however, this Pro version still features some high-class imaging perks, such as a 4K-2160p maximum video-recording resolution and AI scene recognition. This Zenfone's 4GB RAM might come off as a slight con for some users as well, knowing that 6GB-RAM mid-rangers were starting to crop around the time it hit the market. Fortunately, though, the Max Pro M2 replaces its sibling's 1.8GHz-only engine with a 2.2GHz octa-core Snapdragon 660 engine that's decked out with Qualcomm's AI engine and the FinFET LPP power-saving technology. Feel free to pit it versus the best eight-core smartphones here. 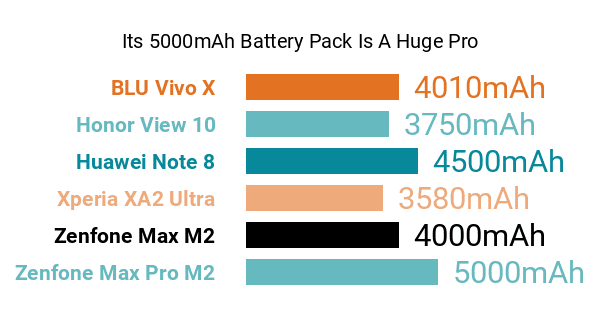 Setting those hardware components aside, the Max Pro M2's biggest pro comes in the form of a 5000mAh battery , which, with self-attributed scores like a 45-hour 3G talk time and a 35-day standby time, could plug it into our list of the best high-stamina phones available. Joining in is its 64GB internal memory that could have been doubled to a full 128GB, but still sounds acceptable, especially with its accompanying support for monstrous 2TB external memory cards . The Max Pro M2's facade is an expansive 6.3-inch FHD+ (2280 x 1080) display with a 19:9 aspect ratio . It is furbished with Corning's toughened Gorilla Glass 6 technology (the latest version as of this phone's market entry), which protects the screen from accidental drops onto hard surfaces from up to a meter. Its pros and cons also include a respectable 13-megapixel LED-flash-equipped (diffused light) selfie camera, an NXP smart audio amplifier, and two SIM card trays. Summing up, the Zenfone Max Pro (M2) caters to power-hungry users who also appreciate some AI-aided imaging features and a large, toughened display.